The GOP's national convention kicks off next week in Cleveland, Ohio, and there's one prominent Republican from the state who's currently not attending. That would be John Kasich, the one-time Republican candidate and the current governor of the state. Given that he's not far away — the governor's mansion is just over two hours away in Columbus — his absence is remarkable. He's not expected to speak or eevn show up, even though many Republicans are hoping to court him to support Trump and make an appearance. So why isn't John Kasich going to be at the Republican National Convention? The answer comes down to one word: "Trump." 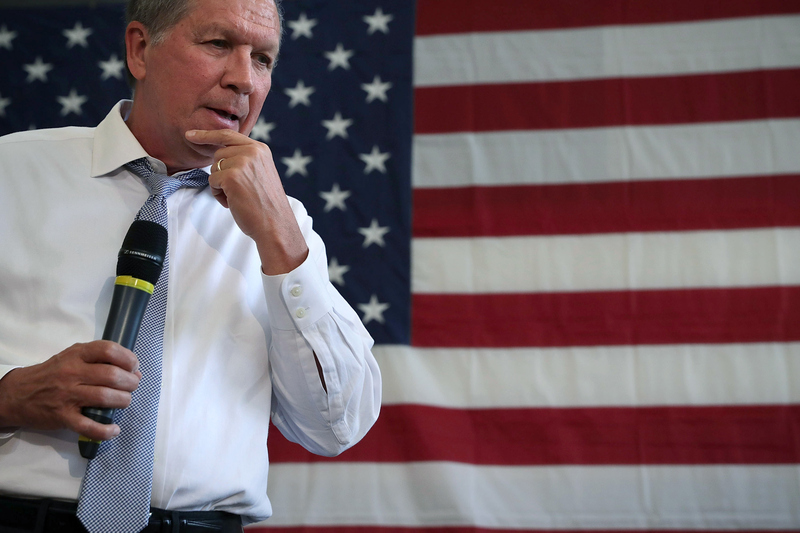 Kasich can't bring himself to endorse the presumptive Republican nominee. Back in June he told Fox News, "Why would I feel compelled to support someone whose positions I kind of fundamentally disagree with?" His position hasn't changed since. CNN reported that RNC Chairman Reince Priebus has pressured Kasich allies to get the governor to show. The party is focusing on uniting to show they can take on Clinton effectively, but so far it hasn't worked very well. Kasich isn't alone in skipping. Four of the five last Republican nominees for president have decided not to show either. We have not asked for a speaking slot and have zero expectations of receiving one. Governor Kasich will have a full schedule of events around the convention aimed at helping Republicans keep control of Congress and winning down ballot. Of course, this will be on top of his responsibilities as governor in regard to security issues in Cleveland. The presumptive nominee pretty much controls the convention. Given that, it's unlikely Trump would ask him to speak without an endorsement. He said as much to The New York Times in June regarding both Kasich and Texas Sen. Ted Cruz. "If there’s no endorsement, then I would not invite them to speak," Trump told the paper in an interview. This goes against tradition in a number of ways. One, Kasich is the governor of the state the convention is being held in. Normally the governor and other prominent politicians from the state would be invited. Two, he ran himself. The runners-up almost always head to the convention to pledge party unity, which is why Priebus is so hell bent on getting Kasich there. If I'm going to show up at the convention, and I'm not going to be saying all these great things about the host then I think it's inappropriate. I don't think that's the right thing to do, it doesn't feel right to me inside. You can't fault him for sticking to his convictions, and Trump has less than a week to convince him otherwise. What will be interesting to see is what Kasich says at the events he does attend.